As early as the Dutch Tulip Bubble of 1637, markets of all types have traced out repeating price patterns based on trading psychology and human nature. As a technical analyst I look for these chart formations, typically over a six-month period and using daily prices, to filter out “news noise” and help guide my movements. Head-and-shoulders, double top, triple top, wedge, cup-with-handle and channels are common chart patterns. Last week, as the Dow Industrial Average crossed the 16,000 threshold for the first time, the S&P 500 chart above circulated in financial media circles. 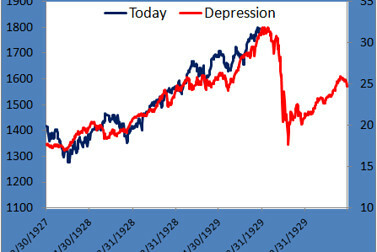 It compares the S&P 500’s behavior over the past two years with the benchmark’s price movements during the late 1920s leading to the Crash of 1929. A little unnerving, isn’t it? But before you head for the exit door, take a look at the chart to the right from an analyst at institutional trading firm Miller Tabak that offers a different perspective of the same data. Miller Tabak’s chart overlays the S&P 500’s actual percentage moves during both periods. Still, it’s never wise to be complacent. The run-up from the March 2009 low has now lasted 2.5x longer and returned 2x more than the average cyclical bull market. We’ve also seen how traders run for the exit doors every time the specter of Fed tapering is raised, serving as a constant reminder of how fragile this bull market will be when the Fed removes the punch bowl. A related read from Sunday’s USA Today: Why does Wall Street fear Fed’s taper plan? I was reading somewhere that 75% of the S&P index rise over that last year can be attributed to P/E expansion. If we get index earnings around $121 (rough consensus) we are already trading at 15x next year’s earnings. Not too rich, but not exactly a screaming buy. We need to get upside earnings surprises and/or further expansion of P/E’s to get higher prices. Could happen, but . . . I agree that investor complacency has no place given the reasons you outlined in your post. P/E ratios don’t factor into my own analysis, but I hear you… A couple of good resources for Bull Bear Barometer readers interested in tracking this data – http://www.multpl.com/ and http://online.wsj.com/mdc/public/page/2_3021-peyield.html. Arghhh…..I’m a little frustrated with those charts. I must absolutely disagree with both of those charts. I don’t think there will be a market crash soon. Taking a closer look at those charts. Notice volatility. 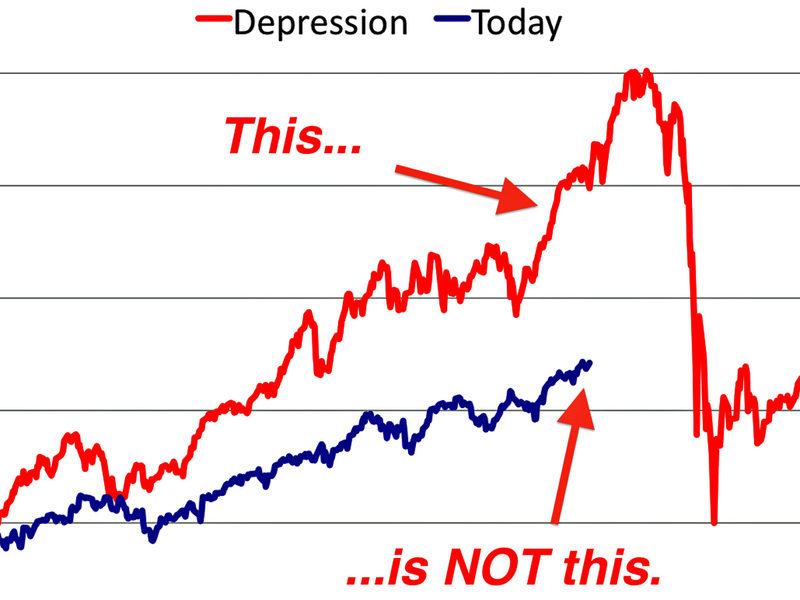 It’s much lower in our current market compared to when the crash happened. Also, you are leaving out the volume traded. Prior to the crash, huge volume spikes across all indexes pointing out critical price levels. You’ve also left out the moving average 50 and 200 day. During the crash the 50 was below the 200 (bearish). Currently it is not. Of course technical analysis is highly subjective. As much as we try to take a scientific approach to charts, we all have a bias. Prudent risk manage should be applied, just in case. I swear if the market crashes, I owe you dinner. Not my charts! They came courtesy of Dan Greenhaus of BTIG (https://twitter.com/DanBTIG) and Andrew Wilkinson, an analyst at Miller Tabak. To add to the conversation, take a look at today’s McClellan Market Report contrasting the Dow’s run-up to 1929 with today’s price behavior – http://www.mcoscillator.com/learning_center/weekly_chart/1929_analog/. McClellan’s analysis suggests a major market top in mid-January.